The Rubin Health Center in St Petersburg Fl specializes in Knee replacement Rehab and has all the knowledge and equipment needed to restore your knee following surgery. Knee rehab involves working with your joints, ligaments, tendons, muscles to make sure you get years of service from your knee replacement. The rehab on your knee must start immediately after your knee replacement, to ensure a successful outcome for your surgery. Knee Replacement Rehab of your new knee requires, professional and specialized care to restore your knee so you have normal movement, strength and control of your knee without pain. The Rubin Health Center has years of experience to ensure your optimum recovery time during your post-surgical rehabilitation. We work closely with Orthopedic surgeons all over the Tampa Bay Area to make sure your getting the best results possible. Every day following your knee replacement surgery, will be aimed at ensuring your complete recovery. Our post-surgery rehab program is an active process and our therapists are highly trained to customize a rehabilitation program customized for you, to make sure you’re gaining more strength, ability and range of motion everyday. 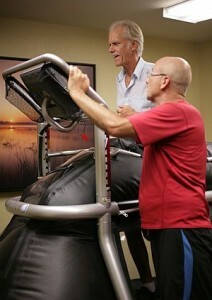 The Rubin Health Center therapist will push you more intensely as your therapy and strength progress. It takes time for your body and your new knee to heal and we understand what you’re going through and we’ll keep you’re comfort at the forefront of your treatment. We’re also aware of the emotional as well as the physical hurdles you’ll experience during your recovery, so once again we’ll customize a plan for you, while ensuring you meet the goals of recovery in the shortest amount of time. The Rubin Health Center therapist work one-on-one with you to provide the most effective treatment program possible. We will also follow your physician’s specific prescription and develop a comprehensive physical therapy program to ensure your full recovery from your knee replacement surgery. Dr Rubin has a hands-on approach which ensures you’ll be completing your required exercises, correctly and effectively. We’ll also be teaching you strength techniques and make sure you don’t have any muscle imbalances that will ensure that you have the correct posture and body mechanics to make your everyday activities easy. You’ll also be given exercises for you to do at home to make the recovery process as short as possible. We also work closely with strength and conditioning coaches to strengthen the muscles and tendons needed to compete in the sport the patient is involved in. We also are one of the few locations in the Tampa Bay Area that Have an Alter G Treadmill, which will speed your recovery from knee replacement surgery. Call the Rubin Health Center in St Petersburg today at 727-822-1555 for free consultation.